Who doesn’t love an easy meal? My misbehaving eye was banished to the naughty corner yesterday so I was cooking with my pirate patch on. Even one-eyed I still managed to whip this up with little effort, proving that ANYONE can cook a nourishing meal for themselves with a little determination. Spinach and ricotta is a tried and tested combination, and this versatile dish will feed a family, or give singles or couples a good meal and some tasty leftovers. 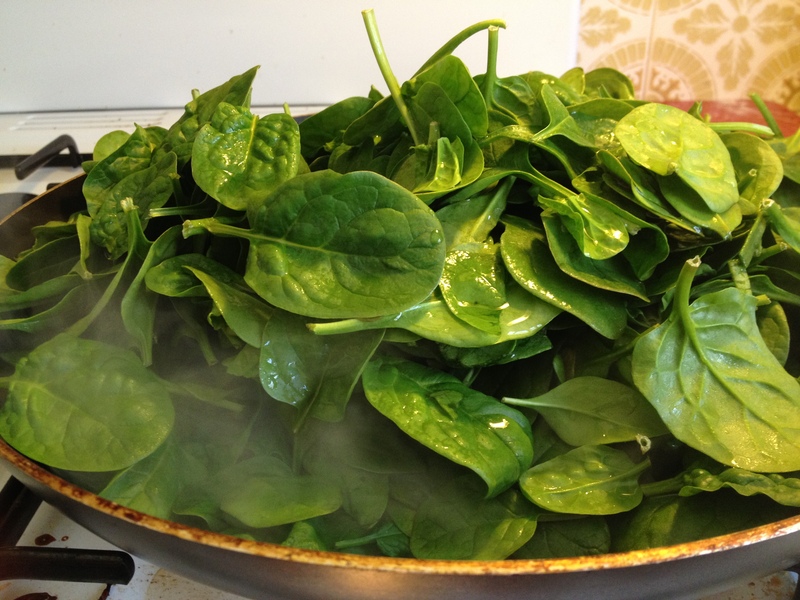 Leafy greens like spinach are chock-full of nutrients and fibre. 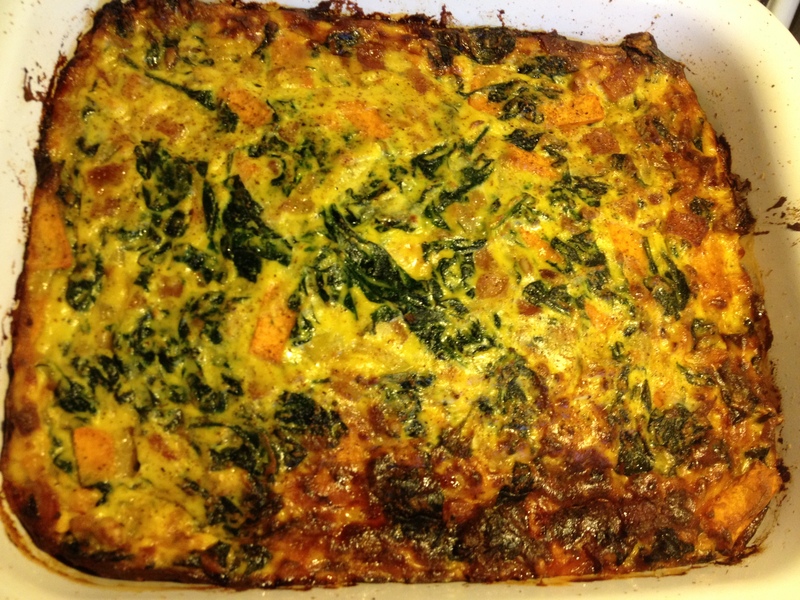 I used baby spinach for this recipe, but I have also substituted silverbeet, beetroot tops, and chard very successfully. The sweet potato really adds to the flavour too and keeps the pie low GI for sustained energy. This recipe is high in protein, and is equally yummy served hot or cold. 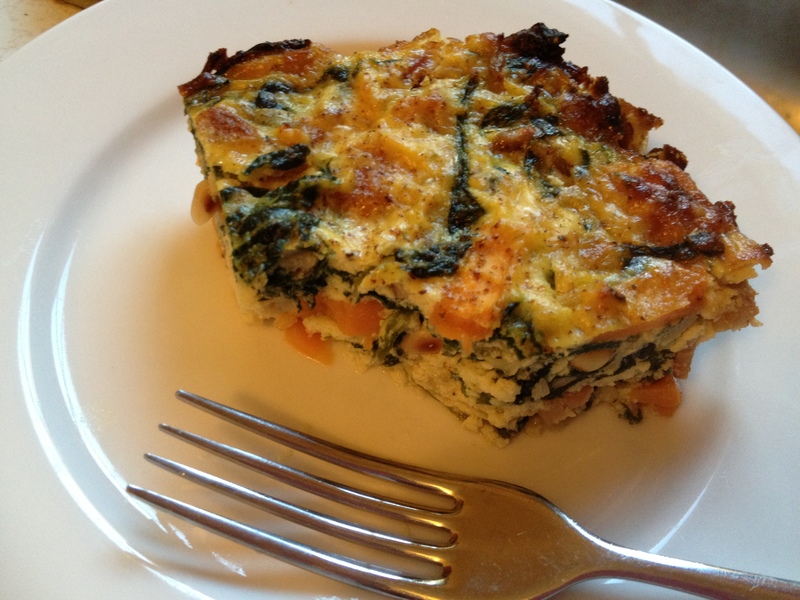 500g of fresh spinach to give about 2 cups of wilted spinach (you could also use frozen spinach – just defrost and drain before use); 500g of ricotta cheese ( 2 cups), 2 tablespoons of pinenuts, 4 eggs, 4 rashers of bacon – chopped into small pieces, 1 large onion – diced, 2 cloves of garlic – crushed or chopped finely, 1 tablespoon of butter or fat of your choice, 2 cups of golden sweet potato – chopped into small pieces, 1/2 cup of crumbled or grated cheese of your choice – tasty, parmesan, fetta etc, pepper and nutmeg. Preheat your oven to moderate (160 degree celcius if fan-forced or 180 degree oven – 350 degrees fahrenheit). Use half the butter to grease a large baking dish. Choose based on how much mixture you make – if you add in extra vegetables you’ll need a bigger dish.You could also line with baking paper if you prefer. 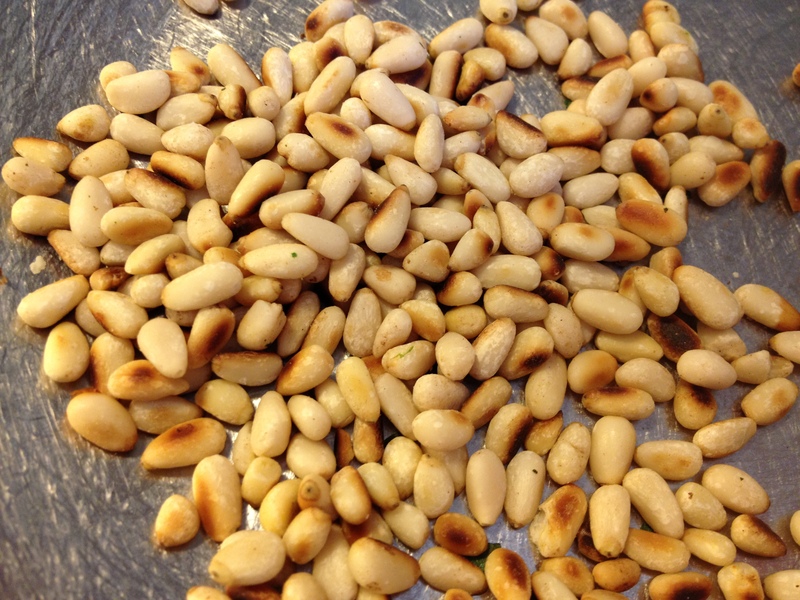 Place a large frypan or saucepan on medium heat and dry-fry your pinenuts until golden. Set aside in a large bowl. 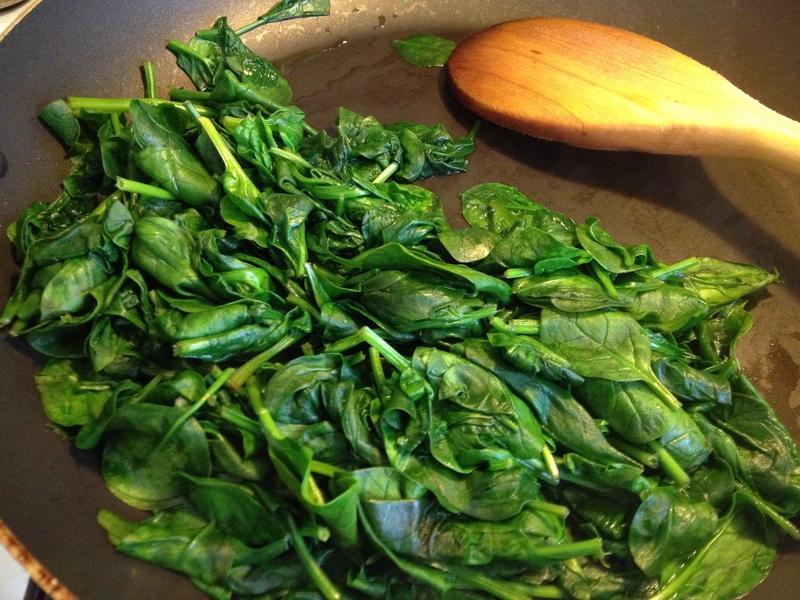 Now add the raw spinach to your pan and pour in about a tablespoon of water. If it won’t all fit, cook it in batches. Cook over medium heat until wilted. Tip into a colander to drain out any juices. 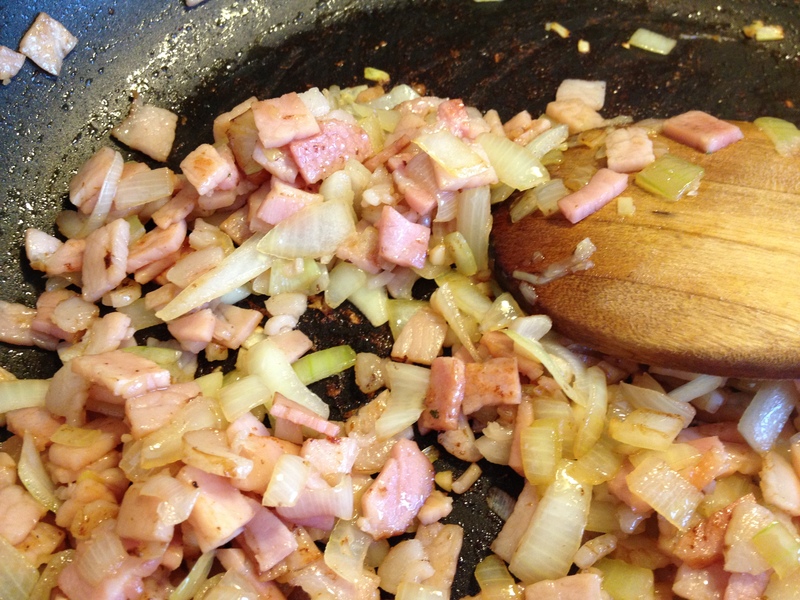 Return pan to heat with remaining butter and fry off your bacon, onion and garlic until coloured and fragrant. Cool slightly. 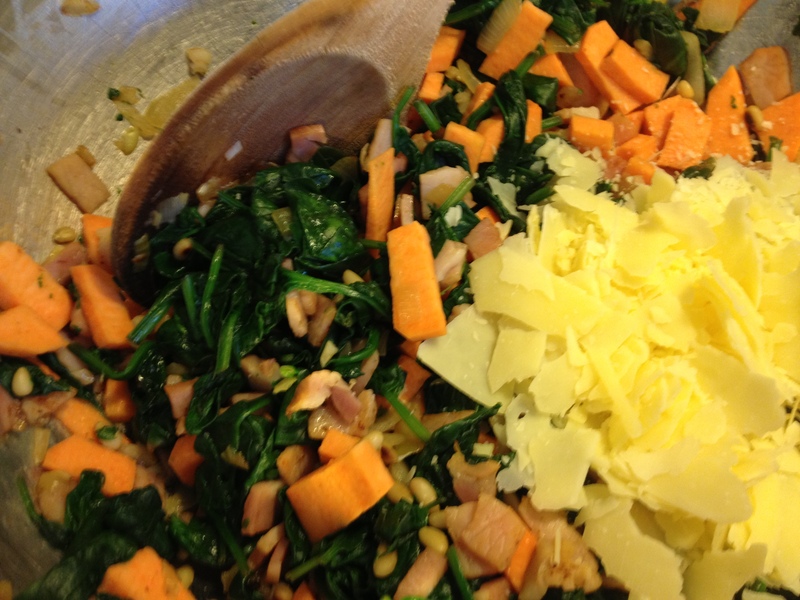 Tip onion mixture, spinach and sweet potato into the large bowl with the pinenuts. Mix thoroughly. Add cheese and stir again. 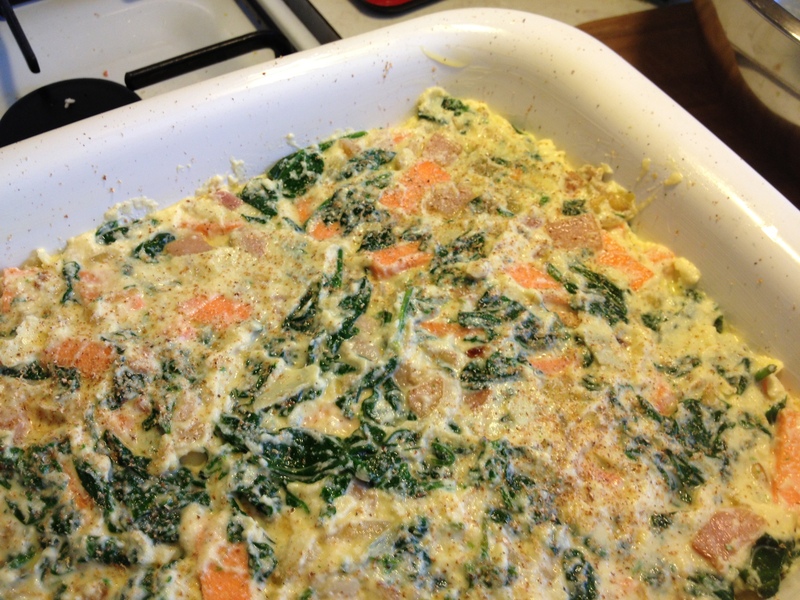 Beat eggs and ricotta until combined and then fold through the spinach mixture. Season with cracked pepper. Pour into prepared baking dish and smooth with the back of a spoon. Grate a little fresh nutmeg over the top. Place into the hot oven and bake for 45 minutes or until firm and golden. May be eaten hot or cold. Delicious with a salad or seasonal vegetables. It also makes a great lunchbox item or easy breakfast. Will keep in fridge for about five days. Can be frozen too. If you’re time poor, double the recipe and bake two pies. Eat one now and cool one and then cover well and freeze. Or dollop into greased, non-stick muffin tins and bake individual pies. For vegetarians: Omit the bacon. For vegans: Omit bacon, eggs and cheeses. Use 2 cups of cooked white beans, pureed with a little extra garlic and olive oil. For dairy free: Omit cheeses. Use olive oil instead of butter. 2 cups of cooked white beans, pureed with a little extra garlic and olive oil instead of the ricotta. Try ham, smoked chicken or salmon instead of the bacon. Substitute pumpkin or potato for the sweet potato. Add a few cups of other seasonal vegetables such as zucchini, corn, cauliflower or broccoli to make the meal go a little further or for a different taste. Slice some fresh tomatoes over the top before baking. 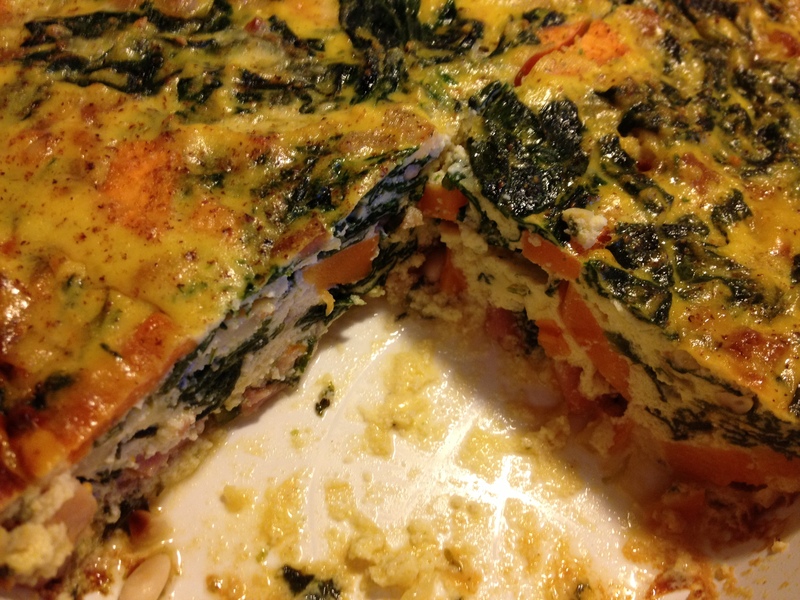 This entry was posted in Gluten-free, Main Courses, Vegetarian/Vegan and tagged baking, better with bacon, gluten, high protein lunch, high protein recipe, low carb recipe, paleo spinach pie, spinach pie recipe by Cauldrons and Cupcakes. Bookmark the permalink. That looks pretty darn tasty! Yum! So looking forward to the return of bacon (&/or ham) and cheese to my cooking (given beans are currently also on the no-go I shall wait). I’m glad the eyepatch allows you to function and give you a reprieve from sleeping, but rest you must. Thanks Nicole great recipe . I start a new job today so i will have less time but i will always find time for your post …luv em . Glad to see you’re a little better . Since my recent gastric episode I have gone wheat+gluten free so thanks for this recipe! Making this to take to my daughter’s place. I made this recipe last night and it was a winner! I love it!